The Tudors encompass one of the most exciting periods in English History. The dynasty of the Tudors include Kings and Queens such as King Henry VIII and his daughters - Bloody Mary and Queen Elizabeth I. The period of the Tudors covers English History from 1485 - 1603. In 1485 Henry Tudor won the battle of Bosworth and became King Henry VII and started the famous dynasty of the Tudors. Henry VII cemented his succession of the Tudors and settled the friction between the Yorkists and Lancastrians by marrying the Yorkist heir, Elizabeth of York - this effectively ended the English Wars of the Roses. The dynasty of the Tudors coincided with the emergence of the Renaissance Period. The Tudors reigned over England seeing the end of the Middle Ages and the beginning of the Renaissance era of new thinking which changed the culture of the English people. Famous Tudors, both men and women, achieved prominence in the fields of arts, literature, science, exploration and philosophy. The Tudors also saw the turmoil of religious reform. The greatest of all the Tudors was Queen Elizabeth I. Although a prominent member of the dynasty of the Tudors her reign is often referred to separately as the Elizabethan Era. Who were the Tudors? The Royal Tudors family tree traces the start of the Tudors dynasty with Owen Tudor and the family tree ends with Elizabeth I. Queen Elizabeth I died childless, thus ending the famous dynasty of the Tudors, and she was succeeded by King James I (1603–1625) and the dynasty of the Stuarts. Who did the Tudors marry? The six wives of Henry VIII immediately spring to mind. Who were the children of the Tudors? And who were the close relatives of the Tudors? Full details of the Tudors and their family tree is available in this section. The most magnificent of all the Tudors - King Henry VIII. Henry was a second son and destined for a life in a church until fate took a hand when his elder bother, Arthur, died. Henry's destiny changed from secular to the monarchy. 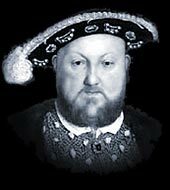 In his younger days King Henry VIII was a handsome and athletic young man. Intelligent, affable and fun-loving. What happened to change him into an obese, cruel and terrifying monarch? A devout Roman Catholic, awarded the title of Defender of the Faith. He turned the life of the Tudors upside down when he broke from Rome and created the Church of England. Why did he take so many wives? Read about the life of King Henry VIII the most fascinating of all the Tudors. Everyone who thinks about the Tudors remembers the larger than life figure of King Henry VIII and his six wives. What were their lives like and what path led them to marrying the most powerful man in England? These Tudors were heroines of the period. Pious, humble, stubborn and loyal Catherine of Aragon. Proud, witty and ambitious Anne Boleyn. Modest, quiet and obedient Jane Seymour. Good humored, sensible and kind Anne of Cleves. Flirtatious, promiscuous and foolish Catherine Howard. And lastly Catherine Parr who was intelligent, kind and dignified. The Tudors were all different. The first child of Henry VIII was the daughter of Catherine of Aragon who they called Mary. Mary was a Catholic. Her nickname - Bloody Mary - came from the number of Protestant Tudors who were executed during her reign. The Tudors are seen as a lusty family. So why was Elizabeth referred to as the Virgin Queen? Her life was surrounded by scandal and dangers but she survived to become the most accomplished monarch of the Tudors. Intelligent, vain and independent Elizabeth. She ruled England during the period of the Tudors when women had very few rights and were viewed as subservient to all men. How did she manage this? Her reign within the dynasty of the Tudors saw the emergence of great poets, writers, dramatists and explorers. The dynasty of the Tudors was symbolised by the Tudor Rose. The Tudor Rose was the emblem of the Tudors and represented the fusion of the White rose of York and the red rose of Lancaster. An important emblem the Tudor Rose marked the devastating Wars of the Roses. This section covers the design and adoption of the Tudor Rose by the Tudors and where the Tudor Rose emblems could be found. Pictures of the Tudor Rose are also included in this section of the Tudors. Another comprehensive section covering the fascinating times of the Tudors. The Mary Rose was the flagship in the navy of King Henry VIII - the most famous ship of the Tudors. The Mary Rose was named after King Henry VIII's sister Mary and the rose, the emblem of the Tudors. The Mary Rose capsized and sank with the loss of all but 35 of her crew during the Tudors Battle of the Solent in 1545. The Battle of the Solent was a naval battle fought between the fleets of King Francis I of France and King Henry VIII of England. In 1979 the Mary Rose Trust was formed to excavate the wreck and on October 11, 1982 the wreck was lifted from the sea - a symbol of the Tudors naval power. This section also covers the Tudor navy, wars, navigation, ships, sailors, explorers, warfare and weapons. Wealthy Tudors are immediately recognised by their fabulous clothes. Fashion was important to the Tudors for both the men and the women. This section covers the clothes in Tudor times and the fabrics used to make clothes for the Tudors. What were the rich Tudors clothes like? What were the poor Tudors clothes like? What did the Tudors wear for their wedding clothes? Why were the Tudor clothes different for Royalty and Nobles as opposed to the poorer Tudors? King Henry VIII enacted Sumptuary Laws which were designed to to keep the different classes separate. The clothes of the Tudors were regulated by law. It did not matter how wealthy you were - Tudor clothes indicated status and violation of these laws could result in loss of property, title or (in cases of lower class Tudors) even death. This comprehensive section provides the History, Facts and Information about the Tudors Clothing covers all aspects of Renaissance clothes and Fashion including Hair styles, Make-up, Jewelry and even Tudors Wedding Dress. The Tudors created the distinctive Black and White half-timbered Tudor Houses which are recognised as one of the characteristics of Middle Class Tudor architecture. Read about the Tudor architecture of the great Tudor houses in this section. The section covers what the Tudors did for their entertainment and how they spent their times of leisure. The Tudors entertainment section provides the History, Facts and Information about the sports and games played during the time of the Tudors. These subjects covered include Fencing, Jousting & Tournaments, Leisure and Entertainment, Games, Gaming and Gambling, Bear & Bull Baiting, Hunting and Hawking during the period of the Tudors - the Tudors certainly knew how to enjoy themselves! Your knowledge of the Tudors can be put to the test with this Tudors History Quiz. The Tudor Quiz has been developed in a multi-choice format and there is an option to 'Ask the Web' and 'Change Question'. Its good fun, highly informative and an easy way to learn more about the Tudors. Each section of this Tudors website addresses all topics and provides interesting facts and information about the era of the Tudors. The Sitemap provides full details of all of the information and facts provided about the fascinating subject of the Tudors!